I wore my new Emerge Border Print Kimono this weekend to a surprise party. The day was beautiful; the sun was shining, the guest of honour was completely surprised at her lovely party and I bathed in the sunshine while the kids played on the hired bouncy castle and I sipped strawberry punch. My pink kimono was perfect for a beautiful spring day, it provided lots of sun cover so I didn’t get burnt but still kept me warm with a layer when the night turned a bit chilly. I imagine I will be wearing this all summer, paired with little denim shorts, skinny jeans, linen shorts or over top of swim wear, it’s a great addition to any summer wardrobe! 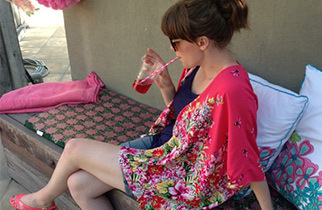 A quick search on EziBuy for Kimonos will show you there are so many styles and colours to choose from! This one is nice and floaty, and if I’m honest, makes me feel like a bit of a movie star! I loved it so much I even wore it the next day to Church! Eeek! Do you do that too? Sometimes when I find something I love I just wear it and wear it!